When starting Excel 2013 from icon in Cognos Controller or when open the data entry form I get a error. There may be old references to old Cognos Controller versions in the registry for this user. mark it and you will get a message that say it can not find the add-in, should it be removed from the list? Please try again to see if excel is working now. This will list both groups for you and the computer and other information. In case above does not work for one user, but the other users have less problem with Cognos Controller and Excel. Run above command on the two users computers, and compare the TXT files for them to find out if the user that Cognos Controller is working for have more RIGHTS on his computer than the person who have issues. Check the section “The user is part of the following security groups” last in the list. Cognos Analytics 11.0.6 adds support for Planning Analytics Local. Here are the new integration highlights in version 11.0.6. As of version 11.0.6, you can make Cognos Analytics dashboards using packages from TM1 or Planning Analytics cubes. As always you create the packages in the Cognos Administration console or with Framework Manager. See Dashboard Enhancements in Cognos Analytics 11.0.6 for information on the OLAP support now available in dashboards. Cognos Analytics connects to TM1 data sources using TM1 client software which needs to be installed on the Cognos Analytics server. Cognos Analytics connects to Planning Analytics using the TM1 REST API which doesn’t require any additional software to be installed. You create a connection to Planning Analytics from the Cognos Administration console by selecting the IBM Planning Analytics data source connection type. If you are upgrading from TM1 to Planning Analytics, within the Cognos Administration data source you can replace the TM1 connection with a Planning Analytics connection. Subsequently you need to re-publish any packages that refer to that data source, but no need to make any changes to the associated reports. Sometimes referred to as “attribute hierarchies” and “named alternate hierarchies”, they are commonly known as simply “PA hierarchies” and are arguably the most important new TM1 server feature in Planning Analytics Local. Here’s a 3 min video on them. Planning Analytics hierarchies appear and behave no differently than any other OLAP hierarchy in Cognos Analytics, but now you can have a TM1 dimension that has multiple hierarchies. You need to use a Planning Analytics data source connection to see multiple TM1 hierarchies within a dimension; if you try to use a TM1 data source connection only the first or default hierarchy will appear within each dimension. TM1 10.2.2 introduced the ability to localize objects in a cube without needing alias tables as documented here. This is supported in Cognos Analytics via a Planning Analytics REST connection only. Cognos Analytics users can see a localized Planning Analytics cube in their language by either setting the Content Language in their user preferences or by setting the report language in the report properties. Note that you do not need to use the language settings that appear when creating a package for Planning Analytics cubes as those are for the legacy alias table localization functionality only. How run Controller 10.3 client to both test and prod environment? You have two environment, PROD and TEST, and want from same computer client be able to connect with same Cognos Controller 10.3 client to these environments. You can not have two different versions on Cognos Controller client installed at the same time on your laptop, because it is risk that it will not work with the Cognos Controller Excel add-in. Here it is same version of Cognos Controller client that should talk to two different Controller Application servers. Please take care and ensure that the client works with the correct database, and that you always clear the local cache inside Cognos Controller 10.3 when you start the program. This to ensure you do not have data from the other database inside the client. After the installation, then you on the client create this files. Copy the file ccr.exe to ccrtest.exe and ccrprod.exe, so you have 3 exe files in the folder. Copy the file ccr.exe.config to ccrtest.exe.config and ccrprod.exe.config, important the names match the previous names. Then open ccrprod.exe.config in notepad. It is only the row WSSUrl you need to change – so it point to the TEST or the PROD server. update the ccrprod.exe.config text file and then save it. Now you have a CCRPROD.EXE that will use the CCRPROD.EXE.CONFIG file to find the server when you start the program. Now right click on CCRPROD.EXE and select “create shortcut” – place the shortcut on the desktop. Now right click on CCRTEST.EXE and select “create shortcut” – place the shortcut on the desktop. There should now be TWO icons for Cognos Controller 10.3 on the desktop of this user. (if you want to install this on several users, then you should copy the 2 *.exe and the 2 *.config files you created and the 2 ccr – shortcut files to each users hard-disk, keeping them in the same folders as now.). To start Cognos Controller 10.3 for the test environment, then you click on the CCRTEST.EXE icon. After you have logged in, you go to menu Maintain – Special Utilities – Clear Local Cache. Then you can start working in your Cognos Controller 10.3 Client session. On the Layout tab, mark windows setting “Display Data Source and User ID”. Restart your Cognos Controller 10.3 client program. Can I install PAW on Windows 2016 server with the native docker that come with Windows 2016? No. PAW does not support native docker on windows 2016. PAW in current state, need that you install the “docker toolbox” on your windows server. The new version Planning Analytics Workspace 21 includes a native install for Windows Server 2016. 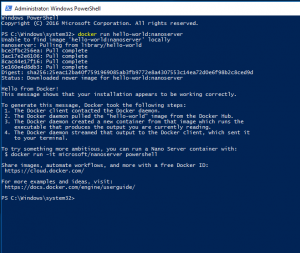 This is the steps to install the docker that is part of Microsoft Windows 2016. But this does not work with PA 2.0 Local. Install Microsoft Windows 2016 server. Ensure that Windows is connected to the internet. Update the Windows 2016 server to latest fix pack version. Start a power shell session as a administrator. Right click on the power shell icon and select run as administrator. import the NuGet provider now? WARNING: Unable to download from URI ‘https://go.microsoft.com/fwlink/?LinkID=627338&clcid=0x409’ to ”. You will be asked to update NUGET – above error happens when you do not have internet connection from your Windows 2016 server. Ensure you have internet connection from your Windows server. WARNING: A restart is required to start docker service. Please restart you machine. You will now have a windows service called Docker that is running. There will also be a new network adapter called vEthernet (HNS Internal NIC). It will start by download the container and then run it. Give above if it works.